The state-owned aircraft carrier has announced a huge number of vacancies for the posts of Utility Hands, RT Operator, Skilled Tradesmen, Safety Officer, Welfare Officer, Aircraft Technician and Skilled Trades Men. Candidates who are eligible and interested to apply must fill the application form before the last date. From 10th pass candidates to graduates all can apply for the following vacancies. Therefore, candidates who are searching for jobs must grab this opportunity. “Candidates found suitable and shortlisted will be engaged on fixed-term contract basis for a period of 05 years. The contract may be terminated at the discretion of the Management during the tenure of the contract and/or in the event of unsatisfactory performance,” the official notification stated. Educational Qualification: Candidates should be minimum class 10th pass. Those having ITI certificate and Light Commercial Transport Vehicle Licence will be given preference. Educational Qualification: Candidates should be minimum class 10th pass. a. Electrical Trade: ITI and NCTVT in Electrical trade holding Wireman license, with experience in repair of electrical equipment, HT distribution system and industrial wiring. OR Diploma in Electrical with experience in same fields as above. b. Welding Trade – ITI and NCTVT in Welding trade. c. Carpentry Trade – ITI and NCTVT in Carpentry trade. Last Date to apply: 02.02.2018. 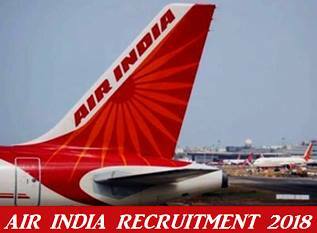 The list of eligible candidates will be informed by email and the list will also post on the official website of Air India Ltd. The Trade-test /interviews for Aircraft Technicians will be held at Mumbai from 15th January 2018 to 19th January 2018 depending upon the number of candidates who qualify the eligibility criteria. Interested candidates meeting with the Eligibility criteria mentioned in this advertisement, as on 01st November, 2017, are required to submit their applications vide hard copies at the venue given below on the date(s) and time as indicated along with the duly filled in Application form, in the prescribed format with all the requisite documents along with non-refundable application fee of Rs.1,000 (Rupees One Thousand Only) by means of A/c Payee Demand Draft in favour of “Air India Engineering Services Limited” payable at Delhi. (SC/ ST/ Ex-Serviceman candidates are exempted from payment of this Fee).